The collapse of the World Trade Towers on 9/11 was caused by a controlled demolition, Donald Trump claims. Speaking to Channel 9’s Rolland Smith and Andy Marcus, Trump appears to side with academics and thousands of architects and engineers who all believe that there is no possible way that planes could have brought down the two towers. It wasn’t architectural defect…The World Trade Center was always known as a very very strong building…Don’t forget that building took a bomb in the basement (1993). Now the basement is the most vulnerable place because that’s your foundation, and it withstood that…I got to see that area, about three or four days after it took place because one of my structural engineers actually took me for a tour, because he did the building and I said “I can’t believe it.” The building was standing solid and half of the columns were blown out…So, this was an unbelievably powerful building. How could a plane, even a 767 or a 747 or whatever it might have been, how could it possibly go through the steel? I happen to think they had not only a plane but they had bombs that exploded almost simultaneously because I just can’t imagine anything being able to go through that wall….I just think that there was a plane with more than just fuel. 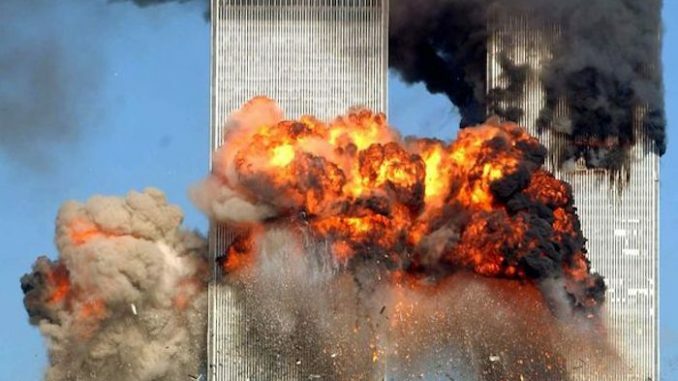 Obviously they were very big planes, they were going very rapidly…You’re talking about taking out steel, the heaviest caliber steel that was used on the building. These buildings were rock solid. Trump also stated the fact that the US government had knowledge before the attack before it happened, and they still did not stop it. He also mentioned that he saw a big hole in some of the steel beams, hinting to explosions. Trump has been quite outspoken regarding corporate control over the government, as well as all of the deceit that goes on as to how our government has been hijacked by rogue groups within the government. It’s easy to see why he was and is completely vilified. It had nothing to do with racism or sexism, and if you think this, you’re simply regurgitating what you get from television programming, and have no understanding of how politics works. Below is a great quote from Robert W. Welch Jr, given way back in 1958, addressing the Deep State. The American empire has had a history of infiltrating and destroying other countries through unethical means (terrorism) and then stepping in to be a ‘savior,’ imposing their will on others. This has been done through the most savage means, with 9/11 being one small example compared to what they’ve done overseas. But it is not representative of America, but rather the corruption within politics and the deep state that in no way represents the will of the American people. Steve R. Pieczenik is one of many people from ‘within’ these ranks who is currently speaking about this. He’s a former United States Department of State official and has been involved with the intelligence community for years. He’s been through and worked within multiple administrations. He has been providing updates on what is happening, the deep state that exists within the American government and how there is currently a ‘battle’ between the Trump administration and the deep state. You can find those interviews online everywhere, he conducted most of them with Alex Jones. He’s also been outspoken and addressed that Trump has already commented on 9/11, and referenced the interview below. This is why Trump has been vilified. I’ll leave you with this great quote from author Richard Dolan, taken from one of his 2016 articles. For more than a year, we have been told that Trump is a racist, sexist, xenophobe, liar, cheat, and narcissist. The attack bears all the marks of a coordinated effort among the major news outlets: CNN, NYT, WaPo, HuffPo, USA Today, and the rest. It reminded me very much of the concerted media attack against Brazil’s Dilma Rousseff which culminated earlier in 2016 in her impeachment and removal from power. In the case of Rousseff, we see what has been alternately described as a soft coup or a Wall Street coup, rather along the lines of the “color revolutions” of a few years earlier (which are now largely understood as CIA-NGO orchestrated). In both cases, pretexts were created and hammered home by an insistent media that whipped up public opinion. In Brazil, it worked. It seemed like it would work in the U.S. There are many reasons to believe that Trump’s survival is a sign that the deep state is losing its power, and that the battle that Steve Pieczenik talks about is going in favor of the Trump administration and their allies. If so, 2018 might be the last year we have to pass through 9/11 without the full and incontestable knowledge about what actually happened.